A tough Dubliner, Eamonn Byrne grew up the eldest of five children and spent his sporting youth playing soccer and winning sprint medals in athletics as an example to his younger siblings. After schooling he became a Dublin police officer and began rowing for the Police Rowing team where, at age 26 he traded boats for bikes and never looked back. He burst on the track scene in 2012 to take a bronze medal in the Irish National Sprint Championship. In May of 2013 he was diagnosed with testicular cancer, underwent successful treatment and was back on the track in just 3 months. 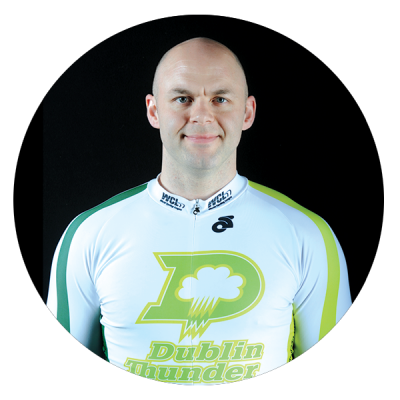 In 2014 he won silver medals in both the sprint and kierin and topped off his amazing comeback by becoming Irish National Sprint Champion last August.